Start Reducing Your Carbon Footprint ! - the Fun Nutritious Delicious Way! Why not start in your own backyard? Many Americans are becoming increasingly aware of the need to take responsibility for the greenhouse gas emissions we create. Carbon dioxide released from burning fossil fuels like oil, coal, and gas can be harmful to the environment. Using a SUN OVEN® can be an important step on the path towards your family becoming "Carbon Neutral". Rated as the Top Solar Appliance in the World! Who in the USA uses one? · Outdoor Gourmets - endeavoring to expand what they can cook and improve the taste of what they cook. · Home Bakers - enabled to bake on stifling summer days without heating up their kitchens. · Environmentalists - looking to Green their lives by saving energy. · Residents of storm prone areas - insuring they can cook when the power is out. · Teachers - seeking to create an authentic learning experience to teach about science the environment and the needs of the developing world. · Slow Food Movement Members - looking for an eco-friendly method to cook good, clean and fair food. · Vegetarian Community - seeking safe natural cooking for their healthy food choices. · Campers - craving unique camp cooking opportunities, or the ability to cook in fire prone areas where open flames have been banned. · Boaters - yearning to improve their menus without spending the whole time in the galley. · Hunters - wanting to improve the flavor and moisture of game. · Food Preservations - naturally drying and dehydrating to create sun dried foods. Bakes, Boils or Steams Any Kind of Food with the Power of the Sun - No Fuel Needed! Totally Safe - No Danger of Fire - Never Burn Dinner Again! If you are not completely satisfied with your SUN OVEN® you may return it any time within the first 30 days and receive a refund. What are you waiting for? Why Cook in a SUN OVEN®? It's all about the Food! The F's of SUN OVEN® Cooking it's Fresh, Flavorful, and Fundamentally Nutritious. The sun comes up every morning, and harnessing the sun for cooking does not deplete the earth of its resources. A SUN OVEN® enables self-sufficiency in the face of the increasing number of weather and natural disasters which lead to power failures. You can purify water or cook your dinner in the event of a blackout. SUN OVENS International is involved in solar cooking projects in deforested countries on 5 continents helping women and children in developing countries around the world and relies on the domestic sales of GLOBAL SUN OVENS® to help finance these endeavors. Thank you for your support ! Why the World's most widely used solar oven? People have used the sun to cook for centuries, yet solar cooking has never gained widespread acceptance. Sun Ovens International has taken a concept that has been around for generations, combined it with the most effective materials available, a design with features that take the hassles out of solar cooking, to create the Ultimate Solar Appliance. Easy Temperature Monitoring - A built in thermometer allows you know the temperature at a glance. Self-Contained Leveling Leg - As the sun is at different points on the horizon the GLOBAL SUN OVEN® can readily be adjusted to follow it. A simple adjusting leg allows you to choose from 9 angled positions. Extremely Well Insulated - A thick batt of non-toxic insulation retains heat. Food cooked in the sun and left in the oven will remain hot for hours. Cold air is held out allowing the oven to be used on sunny days year around regardless of the ambient temperature. Light Weight, Easy to Carry - only 21 pounds (9.5 kg), folds up like a suitcase, equipped with handle for easy transport. It's so easy to use a Child can Operate it! New Model Now Available - The "All American"
Hanging Turkey Roasting Rack - does not dry out, retains moisture. The white meat is uniquely succulent, tender, moist and flavorful. Multi-Lever Dehydrating & Backing Rack Set - Preserve Fruits & Vegetables, Dry Fish & Meats, Bake Cookies, Save on Food Bills and Storage. Water Pasteurization Indicator (WAPI) is a simple thermometer that indicates when water has reached pasteurization temperature and is safe to drink. Pasteurization destroys all microorganisms that cause diseases from drinking contaminated water and milk. A small polycarbonate tube contains a wax that melts when water or milk is heated enough to be pasteurized (65 C/149 F). This saves much fuel by eliminating the need to boil water or milk to ensure that the pasteurization temperature has been reached. Vegetarian dishes come out sweet, nutritious, and delicious in a SUN OVEN®! Temperatures in a SUN OVEN® rise slowly and evenly. This makes SUN OVENS®perfect for cooking legume, grain and vegetable-based dishes. You can cook anything in a SUN OVEN® that you cook in a moderate oven (~225 to 350 degrees), or in a slow cooker. Your SUN OVEN® is perfect for baking whole-grain breads and cakes, roasting vegetables, and simmering casseroles. See how easy it is to create a nutritious, delicious vegetarian meal in a SUN OVEN®. In a SUN OVEN®, mass equals cooking time (heavy, wet dishes like casseroles will take longer to come up to cooking temperature than light, airy ones like breads and cakes). Solar cooking is the simplest, safest, most convenient way to cook food without consuming fuels or heating up the kitchen. Many people choose to solar cook for these reasons. But for hundreds of millions of people around the world who cook over fires fueled by wood or dung, and who walk for miles to collect wood or spend much of their meager incomes on fuel, solar cooking is more than a choice — it is a blessing. For millions of people who lack access to safe drinking water and become sick or die each year from preventable waterborne illnesses, solar water pasteurization is a life-saving skill. There are numerous reasons to cook the natural way — with the sun. At times many families must trade scarce food for cooking fuel. Solar cooking helps them to keep more food and improve their nutrition. Many poverty-stricken families worldwide spend 25% or more of their income on cooking fuel. Sunlight — solar cooker "fuel" — is free and abundant. Money saved can be used for food, education, health care, etc. At moderate solar cooking temperatures food doesn't need to be stirred and won't burn — food can simply be placed in a solar cooker and left to cook, unattended, for several hours while other activities are pursued. In the right circumstances it is possible to put a solar cooker out in the morning and return home in the late afternoon to a hot meal ready to eat. Preserve ("can") tomatoes and fruits. Solar cooker manufacturing and assembly. Solar food businesses such as restaurants, bakeries or catering. Boil rice straw to make paper. Remove husks from rice grain. Reduce imports of — and subsidies on — biomass and fossil fuels. Where forests are disappearing and many people suffer from fuel shortages, solar cookers reduce families' fuel wood needs by 30-50%. Electric companies that have trouble meeting peak hour demand because of heavy use of stoves and air conditioners can reduce that demand by promoting use of solar cookers. Address clients' fuel shortages affecting local health, nutrition and education. Budget savings for institutional cooking fuels and disaster relief situations. In some regions distribution of biomass and fossil fuels are subsidized by aid agencies. Broad use of solar cookers can decrease these costs so that more people can benefit from these humanitarian funds. Two billion people rely on wood and charcoal for cooking fuel. Solar cooking alleviates the conflict between their basic needs and the need to preserve earth's dwindling forests. Biomass and petroleum fueled cooking fires pollute the air and contribute to global warming. Solar cookers are pollution-free, and, when used in large numbers, may help curb global warming. Kitchens remain cool while food solar cooks outdoors. This reduces the load on air conditioners and refrigerators in summer months, saving fossil fuels (and lowering utility bills). No, but dark, thin-walled pots with lids work best. Dark pots change the light from the sun into heat energy. Shiny aluminum pots and pans cause light to be reflected out thereby reducing the oven's temperature. Glass casserole dishes with lids also work well. With the exception of bakery goods, everything cooked in a SUN OVEN® should be cooked in a pot with a lid. Lids hold steam in the pot. If a lid is not used, the steam will fog the inside of the glass and reduce the temperature. For baking cakes, breads, cookies and pies, dark cookie sheets and baking tins work best. Focusing a SUN OVEN® is very easy. All that is required is to watch the shadows created by the oven. When the shadows are even on all sides, the cooker is directly focused. The built-in leveling leg on the back of the oven allows for easy tracking. The size of the SUN OVEN® is 19'' x 19'' with an average depth of 11''. The total weight is only 21 pounds, Plus carry handle. Yes, a SUN OVEN®can be used on a clear winter day. The most important factor in using a SUN OVEN® is the brightness of the sun, not the outside air temperature. Often, a 40-degree, clear, low-humidity day will allow food to cook faster than a 100-degree day with high humidity. The SUN OVEN® has been used very successfully at the base camp of a Mt. Everest expedition where the temperatures are often well below zero. There are, however, more cooking hours available in the summer than in the winter. In the summer, it is not unusual to cook from 8:00 AM to 6:00 PM, whereas during the early winter, effective cooking is limited to 10:00 AM to 2:00 PM. 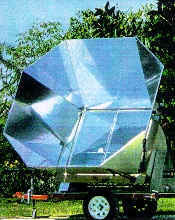 Yes, SUN OVENS International, Inc. is involved in solar cooking projects in deforested countries on 5 continents. We have been innovative in developing methods of placement, training, and marketing to assist in the positioning of over 34,000 family sized GLOBAL SUN OVENS® in the U.S. and more than 100 developing countries, and 250 large VILLAGER SUN OVENS®in deforested developing countries. We are striving to develop and implement comprehensive solar cooking programs which will radically decrease the developing world's dependence on fuel wood and dung as the primary cooking fuels, while benefiting the environment, raising the standard of living, and improving the health of the poor worldwide. Domestic SUN OVEN® sales help finance these endeavors.